Stick to a safety first approach when dealing with inquisitive snakes. The critter has wandered into the building in search of a cool and shady spot, and the last thing it’s looking for is hostility. Instead of raising those distress levels to the point of panic, employ a state of calm and consider the humane solution. Snakes are fascinating creatures, dangerous in many instances, but deserving of conservation. If we could switch perspectives for a moment, it might even be possible to realize that humanity is often the invader, moving into territory traditionally occupied by animals of the desert, the forest, and the wild plains. Of course, it’s easy to lecture these points, but it’s almost certainly harder to employ this logic when a snake is hissing from under a table or slithering toward a vent. Safe snake removal services are the humane solution here. Hang on to this important principle and keep a level head. The first step is to keep a distance between the snake and any human contact. Don’t rashly attempt to identify the species. A snake can move faster than the eye can follow, and it’s simply not worth taking the risk. Assume it’s venomous and potentially dangerous for the moment. Mark off a space if it’s sleepy and docile. Close ground vents to prevent its escape into a network of AC ducts. Remember, the chances are the snake is harmless, but we need to underline the message that it’s never worth getting too close to the snake. Leave it be and call for help. 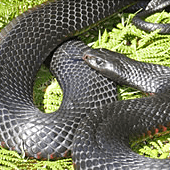 Professional snake removers know exactly how to handle a snake, and they can quickly identify the genus, passing on the information to the occupants of the property. Armed with effective handling tools and equipment designed to rapidly capture any size of snake, an expert solution is the only solution in a case where a life-threatening creature may be present. At the end of the day, this reptilian creature is part of the pecking order within our home lands. They eat vermin, keeping mice and rats from infesting the home. While one bite from a venomous snake can end a life, hospitals keep anti-venom compounds on stock for just such incidences. Learn about snakes, and take the edge off of the fear. They’re to be avoided within a property, kept away from kids and pets, but they’re a spectacular part of nature.